From a century of genocide and ecocide by war-based corporations to a future of seed freedom, food freedom based on rights of nature and rights of humanity. In the last century big agribusiness with roots in the World War have poisoned millions of people, destroyed biodiversity, pushed small farmers off their land, and attempted to take over every aspect of our life. The potential of this harm increases as these corporations become fewer and bigger. An example is the recent bid by Bayer to buy Monsanto. Using free trade neoliberal policies and deregulation of commerce to enlarge their empires, these corporations are attacking life on earth and biodiversity. They have broadened their control over our seed, our food and freedom, robbing us of our human rights and democracy. They have established monopolies and threatened farmers rights to seed and people’s rights to affordable medicine through patents and IPRs. In October 2016, Navdanya joined multiple civil society organizations at the Monsanto Tribunal and People’s Assembly in The Hague. Over the last months, the Monsanto Tribunal judges have been analyzing the testimonies of witnesses and experts on the damage caused by Monsanto. On April 18th, the judges have publicly presented their conclusions and legal advisory opinion in The Hague, which aims to contribute to the development of international law by the inclusion of new issues, such as the responsibilities of business with respect to human rights, and by formulating new concepts, in particular the concept of ecocide. Being also an educational tribunal, the Monsanto Tribunal is a way also to enable the public to understand the impacts of Monsanto’s activities. The process of holding the “Poison Cartel” accountable for its crimes is the culmination of 30 years of scientific, legal, social, and political work by movements, concerned citizens and scientists. The People’s Assembly was a gathering of leading movements and activists working to defend our ecosystem and food sovereignty, to lay out the effects of industrial agrochemicals on our lives, our soils, our atmosphere and climate, as well as to chart the road to our future based on Seed Freedom and Food Freedom, agroecology and farmers rights, our commons and economies of sharing, rights of nature and earth democracy. 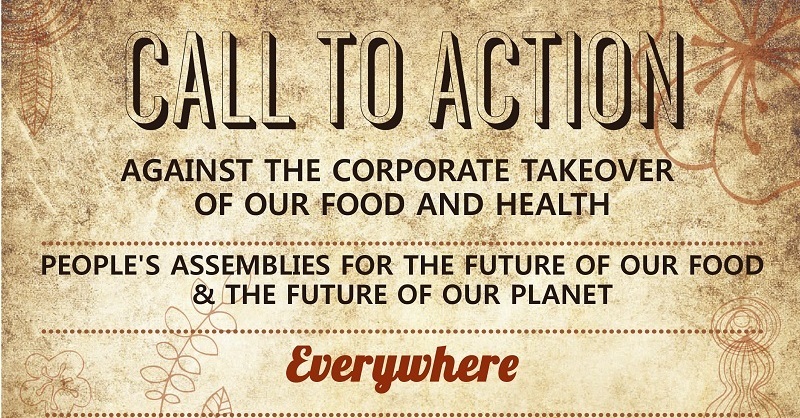 With multinationals closing ranks through mergers to become bigger and more powerful, the civil society movements at the People’s Assembly have committed to joining forces to reclaim people’s rights to healthy food and a healthy and safe environment and to defend human rights and environmental rights and regulations gained through years of social struggle. Please join us in celebrating in a new series of actions from 22 May, World Biodiversity Day to 5 June, World Environment Day, to celebrate Earth’s biodiversity and add strength to the movement against the Poison Cartel by organizing a People’s Assembly wherever you are to shape a better future of our food and our planet. Add strength to the movement against the take-over of our seeds and food by singing the Pact for Diversity. Over the last months Navdanya has joined the widespread opposition against poisons in our food system and is calling citizens throughout Europe to sign the European Citizens Initiative to #StopGlyphosate and demand the EU to reform its pesticides approval procedures. If you haven’t already, please join the campaign and sign online here: http://bit.ly/ECI_StopGlyphosate. On 24th of May in Rome, Navdanya launched the report “Poison is served – Glyphosate and other poisons from field to table”, in collaboration with ASud and CDCA. The report points the finger at the Poison Cartel, the group of six poison producing seed and agro-giants intent on controlling our food systems, while also making evident the lack of national and international regulations necessary for the protection of our health and our environment. Big Industrial Agriculture is destroying life on Earth, our health and our democracies, causing social, economic, and ecological collapse in every corner of our world. Let us always remember that We the People as citizens of the Earth have more power than the Poison Cartel. It has become ever more critical for people to organize to stop the corporate takeover of our food, our health and our planet. In Germany, from 25 – 29 April 2017: Along with the Coalition against Bayer Dangers eV-., IFOAM Organics International, Colabora and many other civil society movements and organisations, Navdanya has co-organised a “Stop Bayer / Monsanto” mobilization. Multiple farmers movements, environmental groups, trade unions and students organizations have joined the series of actions, which converged in Bonn on April 28th, for a demonstration in front of the World Conference Center where the 2017 Bayer shareholders meeting was held. Along with AStA Uni Köln, Colabora, IFOAM Organics International, the Coalition against Bayer Dangers eV– and others, Navdanya co-organised a People’s Assembly and Town Hall meeting in Cologne on April 27th, 2017, which featured international speakers, such as Andre Leu, IFOAM Organics International – President, Nnimmo Bassey, Health of Mother Earth Foundation – Nigeria and Miguel Lovera, former head of Paraguay’s National Service for Plants and Seeds Quality and Health and witness at the Monsanto Tribunal, among others. In India, Navdanya is challenging the process of the Monsanto-Bayer merger, as well as the Dow Dupont merger. Recently, the Competition Commission of India rejected the Monsanto-Bayer merger application. Navdanya also sent a letter to the CCI warning them about the existing conflict of interest with CropLife which submitted the complete data for the evaluation of the Dow / Dupont merger and cannot be considered a “third independent party” as the same two multinationals are members of it. Navdanya has also organised a mass mobilization from 13 – 23 April 2017. For the “Satyagraha Yatra” (Satyagraha means “Force of Truth), Navdanya gathered movements for democracy which undertook a pilgrimage for Seed Freedom and Food Freedom. In Greece, from 20-22 April 2017, Navdanya joined Peliti at the Olympic Seed Freedom Festival, along with people and organisations from all over the world to join forces to sow the seeds of the future and sow the seeds of another vision for the planet and its inhabitants. The 2017 International Meeting of Resistances to GMOs fits in this dynamic of joint actions. This year’s meeting in Lorient continued the work started in Ouagadougou (Burkina Faso) in April 2016. The core themes of this 2017 meeting have taken inspiration from the dialogues which took place in The Hague during the People’s’ Assembly last October, which also gave proof of how diverse struggles and resistances can converge and kick-off joint strategies and actions across the world. As part of the global action, groups and organisations across South Africa have joined the Seed Freedom movement and have held events as an opportunity for people to rise up against the corporate hijacking of their seeds, freedom and future. Providing solutions through permaculture, seed knowledge, saving, sharing, growing food, overriding the system and exchanging ideas on strategies in the fight against unjust Seed Laws and the Poison Cartel monopoly on farms and seeds.